When designing kitchens, MDK Designs focuses on form, function, and client lifestyle making sure they work together to create balance. We listen to our clients and truly understand their objectives throughout the entire kitchen design process. The kitchen is the most valuable part of the home; we aim to meet your goals, budget and prevent costly mistakes. Most importantly, MDK Designs will ensure the job gets completed to your satisfaction. MDK will manage the job and align quality with price. Our interior design services include tile design, cabinet style, custom cabinets, material selection, color scheme and much more. Providing unsurpassed customer service is just as important as the interior design job. We offer full-service kitchen design services. Master Bedrooms are the most personal, stylized area in a clients home. At MDK Designs we strive to ensure unique personalities are integrated into every design project. The interior design possibilities for a master bedroom are as endless as your imagination. Envision a master bedroom with cool lighting, disappearing TV’s, floating fireplaces, and motorized blinds. Now imagine turning it on/off with the touch of your mobile device. Interior design combined with cutting edge technology is the pinnacle of a smart home. MDK Designs has the expertise and awareness to recommend the right technology to make for an easier lifestyle. From marble interiors to his and hers sinks, soaking tubs to expansive showers, master bathrooms are becoming the spa and serenity of your home. Melanie Kokoros’s interior design approach allows our clients to be closely tied and involved with all aspects of the design process. As Residential interior designers, we partner with experienced professionals that will build your dream into a reality. Designers are your liaison between your architect and contractor to help prevent costly mistakes and create a cohesive look. Team with MDK Designs if you want interior design services that will create an absolutely stunning and luxurious master bathroom. As a singular unified space, our great rooms hold true with the romanticized ideal of great halls and great chambers. Great rooms should focus on function and client lifestyle. With the perfect home accessories, home décor, furniture and architectural detail this will be the go to room for your family and friends. Our interior design approach is to create a cohesive look from room-to-room. Partnering with Melanie Kokoros will keep you style focused, as you filter through the myriad of options and develop a design solution. Residential interior design is a very unique and personal process where each home is designed exclusively for our clients. As interior designers and decorators we are trained to think outside the box and see design potential where the average eye cannot fathom. A specialized design can be found in a custom tile, sofa, window treatments, or custom woodwork. For clients’ eager to integrate unique interior designs and personal style within their home, Melanie Kokoros, Interior Designer, has the solutions. MDK Designs is where functionality meets creativity. After a hard day of work, there is nothing like coming home to relax. We all love a little downtime. Designing a living room that is comfortable, inviting and functional are crucial elements for a living room design. Selecting home furnishings, home décor, color, lighting, and decorative accessories are essential pieces to create the perfect environment. Melanie Kokoros, principal interior designer, has the interior design expertise and interior decorating knowledge to help you create the perfect living space you’ve always dreamed of having. From hosting in-laws for the holidays to having a dinner party with friends, our interior designs for dining rooms are created to suit our client’s lifestyles. Whether you desire traditional, contemporary, or modern, Melanie Kokoros, Interior Designer and Owner of MDK Designs, develops an interior design plan that supports each clients’ individual wants and needs. Working with an interior designer gives you access to our endless resources and private showrooms that will guarantee a custom look. The unique needs of powder rooms call for unique design solutions – solutions that we can provide to each and every client. From creative tile design to textured walls, our interior design process ensures client satisfaction every time. Powder Room designs can be just as creative as any room in your home. From simple design statements to incredible detail and anything in between, your powder room design will be unique and highly functional. 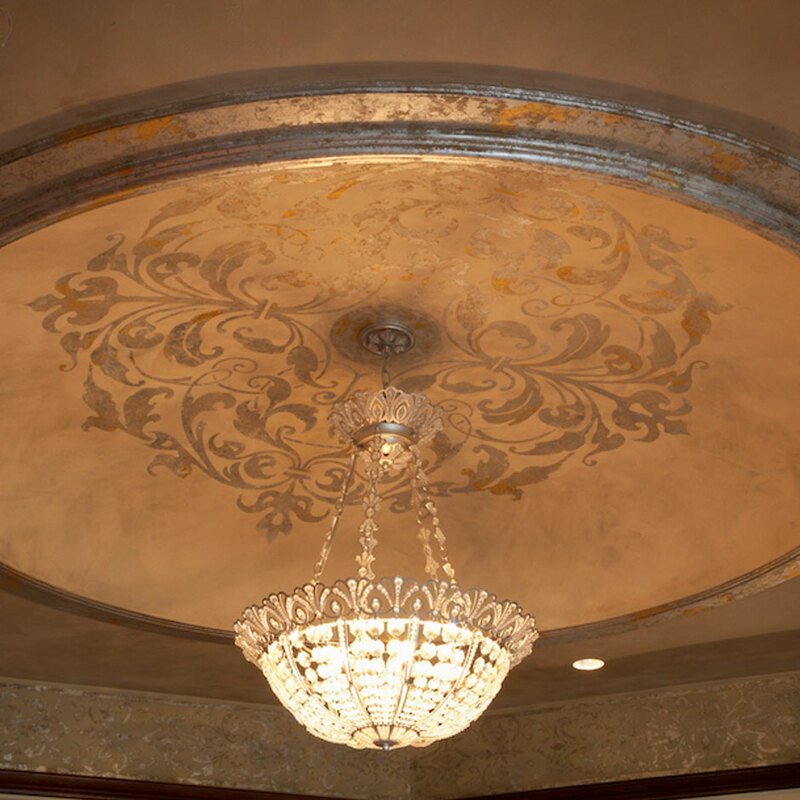 Often overlooked, but never undervalued, ceiling designs can pull together any room. 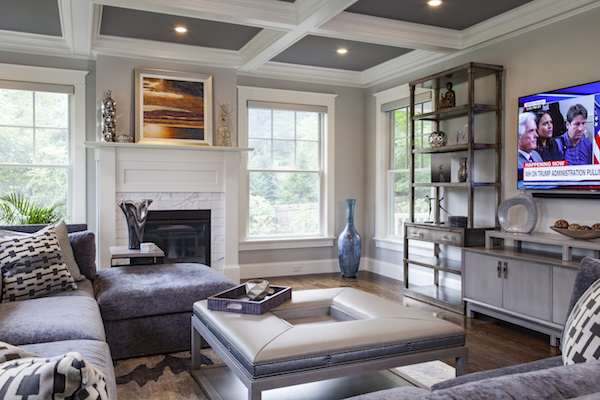 At MDK Designs we love coffered ceilings with applied faux painting or wall fabric. This allows for a nice room transition while each room still works together in harmony. No matter how big or small your project, we will assist and solve any design challenges. We work with the best artisans and tradesmen and have the relationships to ensure a stress-free process. Whether our clients have young children, or are simply active themselves, foyers and mudrooms are developed around lifestyles and organization in mind. As an interior designer, we think foyers and mudrooms are just as important as kitchen and bathrooms. It can be a grand foyer constructed from limestone or a mudroom with cubbies where all your gear is hidden, clean and out-of-sight. MDK Designs understands the importance of how the foyer and mudroom set the tone for your home, it’s the first thing your guest will see. MDK Designs provides interior decorating ideas for children’s rooms. We design dream bedrooms for our favorite youngsters creating the perfect blend of reality and fantasy. As part of our interior design services, we work closely with our clients to ensure their style is woven throughout every decision – including that of their little ones. With busy schedules and no time, interior designers provide you convenience, save you time and money. Melanie and her design team do all the research, shopping, and designing to bring you the best possible results. Home office interior design is essential to creating a focused, efficient space to get your work done. At MDK Designs, we love creating the perfect home office for our clients. From a traditional, dark wood office feel to a modern, clean and bright open space, we can turn your dreams into a true interior design reality. Please download the MDK Designs Client Questionnaire document. You can also download a PDF and fax your answers to 617-977-0924. Use the back of these sheets to provide more information. Thank you for your cooperation. All information will be kept confidential. MDK Design Associates uses the best kitchen cabinet manufacturers, top brand appliances, quartz countertops, and kitchen hardware to bring your entire kitchen design together. 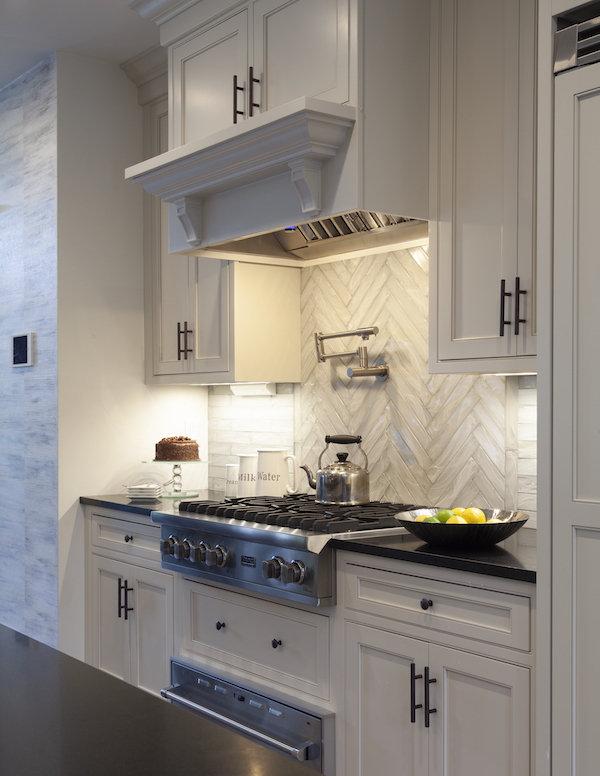 The kitchen designers at MDK Design Associates can help you select timeless kitchen backsplash tiles. Whether you are searching for a kitchen renovation company or kitchen designer near you, MDK has the solution to all your kitchen design needs. Modern kitchen bench seating is a current trend in interior design. MDK Design Associates designs contemporary eat-in kitchen spaces perfect for enjoying meals and drinks with family and friends in a cozy and warm space. The creativity in selecting kitchen lighting is only one aspect. Illuminate your kitchen interior design with island pendant lights perfect for preparation and ambiance at dinner time. Kitchen lighting design is an art in and of itself. Custom designed kitchen with a cambria island and a round dining table. Cabinets are finished with a custom blend to make a light grey iridescent finish for this interior designer Boston home. With modern swivel stools, Cambria countertops and a custom designed light glam-restorative light fixture, this home benefited from home designer service to deliver a kitchen that is stunning. The glass pantry door leads into a full service butler's kitchen with a peak into the mudroom. With impeccable interior design services, I place an emphasis on the mudroom, especially in the Fall and Winter. A traditional kitchen with a remarkable, large island is exactly what our client wanted for this home. The kitchen design infused practicality for the homeowner, with a large kitchen to host dinner parties or family gatherings. Open space for this home design created a larger-than-life feeling for the kitchen extension into living area. Move freely from room to room with ease, perfect for hosting large groups. Traditional home design in this room includes plenty of space to showcase your finest dishware in solid, beautiful wood cabinets and frames. Need to send off a few more emails as you’re making dinner for the family? Fret no more. This kitchen designer truly integrated a mini home office into the kitchen space, excellent for any entrepreneur. Modern kitchen design that maximizes space and selects only the best of the best in quality. Even small kitchen spaces can integrate efficiency into their design. Between your living area and your dining room sits a foyer bar that only a home interior design service would truly envision and execute. It’s a practical addition to the wine or cocktail lover, and an ideal place to mix and mingle at your next home party. Personal touches combined with professional home interior design services made this kitchen a masterpiece. The gourmet kitchen with in-counter stove top is a chef's dream. White flush high-gloss cabinetry, oversized glass subway tile and a Cambria Quartz waterfall island create sleek lines that are unmatched in kitchen design. Designing this bar is a dream come true for any interior designer. Every homeowner would love to entertain their guest with the state of the art appliances, modern custom glass backsplash and high lacquer cabinets. This bar has great personality that intertwines personal interest with practicality. Bedroom interior design at MDK features custom drapery and headboards, exquisite bedding comforters, gorgeous pillow fabrics, mood lighting, beautiful mirrors and furniture. When it comes to interior designs for bedroom, MDK designs the entire bedroom space as a complete retreat for relaxing, reading or cozying up in front of a fireplace or to watch TV. 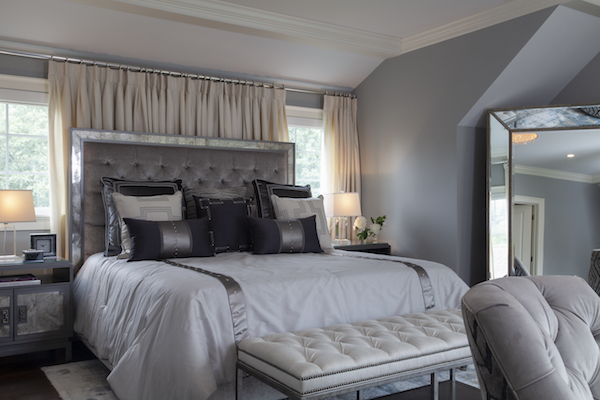 As an interior designer, one of my favorite areas of a home is the Master Suite. With this color palette, I opted for zen and minimalistic. The focus was to establish a relaxing space without distractions. A master bedroom demands presence, which is exactly what we have done with this home design service. A beautiful king bed, built-in headframe and floor-to-ceiling wood walls create a space that you won’t want to leave. Wood, wood, wood everywhere! From the bedframe to custom flooring, entryway to an infusion of Greek goddesses, this master bedroom is sure to impress. Unique spaces call for unique interior design. When working with a unique space, such as this circular master bedroom, offset with opposite shapes, such as this square ceiling light. A masculine bedroom with a pop of color. Our interior designer services integrated the client’s wishes (grey!) with color that infuses personality within the bedroom. A bedroom that infuses feminine touches everywhere. From the swooping curtains to the bedframe and the beautiful bedroom pillows in between, this room is ideal for those young and old looking for a touch of femininity. One of our favorite home design service projects! Personality shines in this custom master fireplace, with artwork that pops and color that shines.The dark walnut and white marble surround have great harmony. Combine modern artwork and traditional furniture selections to bring a room together. Interior designer touches at every turn. Enjoy an astounding view from the comfort of this Boston bedroom. We used calm color palettes with dark blue tones and pops of color on accent pieces and accessories. The hand painted wall covering is an extension of the sky. MDK Interior Design turned this client’s dream into a reality. This master bedroom is alluring and seductive. Designed with subtle textures and minimalistic furnishings. The dramatic lighting and textured walls create a glamorous environment. Bathroom design tile can make a dramatic statement on your wall. Add elegance and beauty to any master bath design with a subtle bathroom tile color for a soothing effect. MDK truly creates distinctive bathroom designs to include heavenly soaker tubs, with interesting glass tile designs that make a room pop. Let MDK help you select master bath tiles and accessories for your next bathroom remodel or redesign. Bathroom design services are unmatched in this Master Bathroom. It is designed with a spa retreat in mind. The steam shower and tub are a great escape for long days at the office, while the light fixture adds allure and a certain romantic charm. 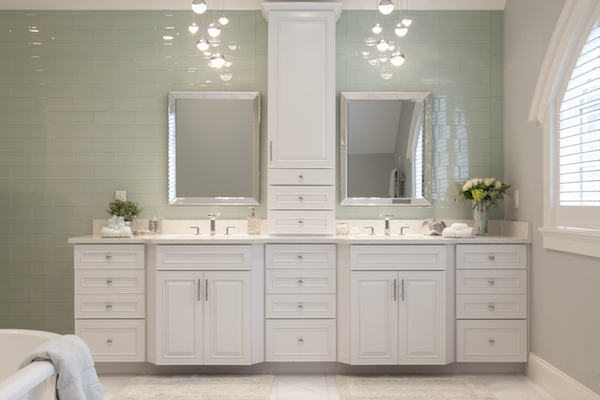 The master bath features a nantucket grey vanity and floating rectangular sinks. The tall single hole faucets create a clean looking vanity area. As a Boston interior designer, I replicate whatever you wish. This modern metropolitan two-toned bathroom located in Boston has plenty of masculine features that I love. The grey background and white lacquer vanity offers great contrast in this master bathroom. Our bathroom design services include feminine bathrooms too. Consider a bathroom design in all-white with grey sparkle grout. Every woman should feel like a Queen in own bathroom. A large bathtub is exactly what you need at the end of a long day. Escape with a hot bath, bubbles and candles! Bathroom design at its finest. Backlit bathroom mirrors provide simply the best lighting for any bathroom. Clean, simple white countertops offset the dark wood bathroom cupboards. A spa-like step-in shower, bath and comfortable lounge chair brings together everything we’ve ever wanted in a bathroom design. Come home to the perfect master bathroom to relax in. A His and Hers master bathroom is impeccably designed with perfect lighting, plenty of storage space and more mirrors than you can count. 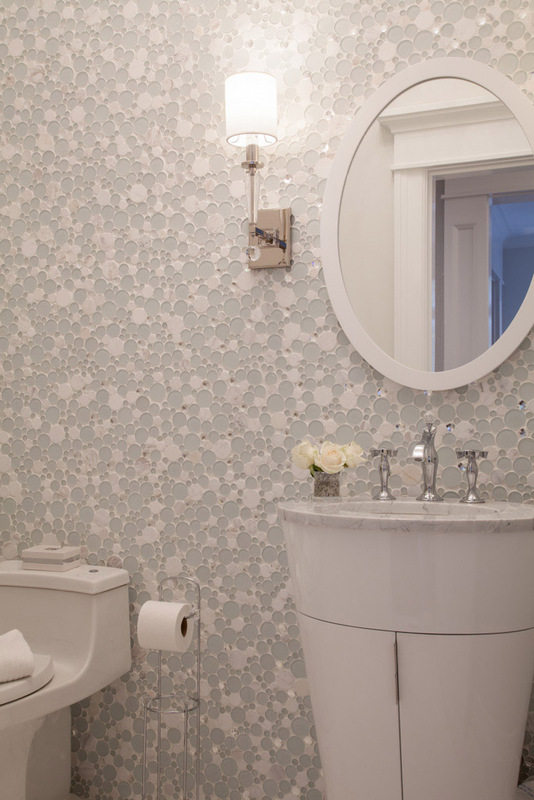 This masculine bathroom has ample tile work in shades of gray and intricate mosaics. The neutral walls are covered in a textured gray metallic wallpaper. The handcrafted marble rainfall shower with glass enclosure mirrors the waterfall edge vanity countertop. Bathroom design in this room brings simple sophistication to the home. The his and her master bathrooms are complementary to each other. They both display a very grand and elegant aura. A warm entrance and neutral shower tiles make this bathroom shine with beautiful chrome features. Bathroom design services were ideal for this client, who needed a complete remodel to their home - and that it was! Beautiful backlighting compliments neutral color palettes from the shower tile to the silver and chrome shower furnishings. Bathroom design services from MDK Designs take the client’s needs into account with each and every project. In this particular bathroom, we knew that the client needed a warm and welcoming guest bathroom with a beautiful step-in shower and plenty of extra space. The sign of a great home design is a truly impressive Great Room. With wonderful, high ceilings and a wall mirror that makes the room feel larger than life, this functional room is excellent for hosting guests. A Great Room that is functional. Built-in fireplace with a feature television is an excellent way to bring the family together at the end of a long day. A room truly built for a large family! You shouldn’t be surprised that a home designer envisioned this room and brought it to life. White-everything is infused with natural lighting to create a room that everyone will want to be part of. The stone surrounding this fireplace is simply remarkable. Built-in television with plenty of storage space make this a cozy, inviting place to be. Clean lines are what this room is all about. Plenty of open space integrates the kitchen, living area and an off-room office means everyone can enjoy the room together. Dressing rooms can function as private space where you can indulge in your unique and exotic tastes. This glamorous dressing room mixes wood and acrylic modern chair and fabric materials with the perfect desk accessories. In the Master Suite I opted for an infinity linear fireplace that has custom color chromotherapy lighting. The marble tile surrounding the fireplace adds a beautiful texture that is unmatched and one that, as a Boston interior designer, I’m proud of. The floor in this bathroom is custom designed tile with laser cut marble, polished mosaic and pewter insets. It’s a true show stopper for interior design. The see-thru fireplace in the lounge is a real show stopper. It peeks into the lounge bar area and features leather tile with a linear glass mosaic placed on the corners. Just enough detail to make a Boston interior designer proud. An in-house pool is excellent for the Boston or New England weather. Spend your weekends enjoying laps in this heated pool, without needing to escape the cold when getting out! Have you ever pictured an in-home bar like this one? Interior design services have made this happen for our client. It’s like your very own Cheers, right at home. From the bar and the billiards tables to the entertainment room, this is a recreation room to behold. Home design has integrated entertainment aspects galore with this basement. There are no excuses for not making the gym when you have this in your home! A beautiful studio with plenty of equipment to hit your goals for this year. What a view - a dream for a home designer! Water and city views perched from windows that extend floor-to-ceiling are truly impressive in this outdoor patio. Enjoy a glass of wine after a long day in the office with this beautifully designed patio. Melanie Kokoros, Interior Designer creates exceptional living room designs with comfortable sofas, uniquely designed coffee tables, distinct media consoles, and modern bookcases for a streamlined and uncluttered look. 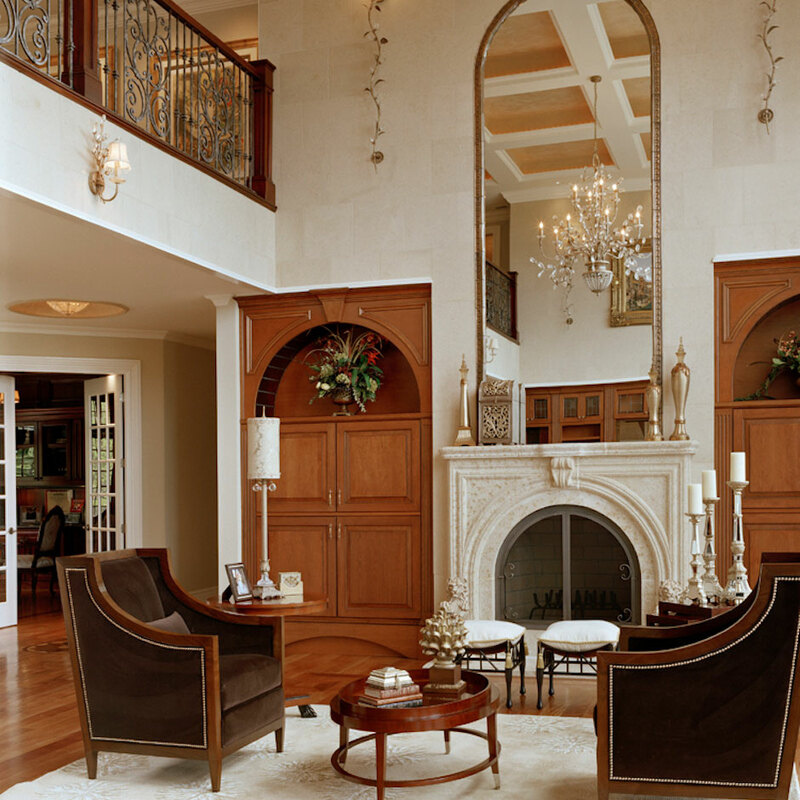 With impeccable Boston home design services comes a Great Room that is beyond memorable. This room features a unique floating wood burning fireplace that is dressed in statuary tile. As a Boston interior designer, I never forget the importance of a Great Room. In this room, the rug and the furniture are all custom designed for the space. The lines are very simple with a modern classic feel. The custom designed hutch is built-in to the Great Room and embellished with hand selected Swarvoski crystals to add a little glamour. As a Boston interior designer, I never forget to add glamour to a Great Room. The wall covering above the hitch is made with Phillip Jeffries Python snake skin. The focal point of this gorgeous living room is a beautiful, custom designed pendant light at different heights. When lit, it appear as if stars are falling. A very monochromatic room with a pop of silver leafing and cobalt blue on the table is all that is needed. Ask anyone familiar with the home designer service space and they’ll tell you just how important the lounge and family areas are. In this lounge, I’ve features a shag rug, oversized modular sectional and a see-thru fireplace to create a large and open feel. A traditional living room that focuses on a sitting and conversation area, elevated television and french doors that extend to the backyard. This room has been personalized with plenty of family photos. A sitting area within a living room simply made for a Queen! Larger than life candles and an in-wall fireplace integrated everything about home design that this client wanted. With a traditional vision and need, that integrates collector antiques and neutral tones, this living room is the ideal sitting area with a view of a vast, open back yard. Interior design services make great use of clean lines with this living room. Sister chairs, from the dining room to the living area, make the rooms feel truly aligned and expanding into one another. This open space design concept in a Boston penthouse is breathtaking. As a professional home interior designer, I used neutral tones with blues, maroons and added a complimentary gold drop lighting fixture. The perfect space for a dinner and cocktail party. A living area that displays refined sophistication. This penthouse interior design is modern, yet comfortable so you can relax at the end of a long day. Neutral colors compliment the lighting and built-in fireplace while highlighting the Boston skyline. This living room is one of the reasons I love being a home designer and provide home design services. This custom built wall unit encased in walnut adds great contrast. Oversized marble tile adds character and movement. Mix suede, leather, metal, wood, and glass for an impeccable combination in any room. As a home designer, I enjoy working with large spaces. We created a large open space concept without feeling lost. Each space is intimate and flows effortlessly without boundaries. We used inviting tones, materials and textures with an astounding gold drop lighting fixture. Melanie Kokoris, Interior Designer has an exceptional eye for creating modern dining rooms. Elegant dining room chairs, bold tables and sideboards, striking lighting, custom window treatments to decorative accessories and stunning art. A dining room should be elegant and simple, which is what I did when creating this room. As a Boston interior designer, I aimed for a sooth, calming touch in this room. The rug is a custom design silk and wool combination to add dimension to this simple space. An open space with plenty of natural light is truly what makes this dining room special. Tones of green and soft lighting complement the home designer taste in all of us. Lighting is the focus of this dining room. Sophisticated drop lights and complimentary candles turn this dining room into a warm, inviting area for a special dinner or event. If a small dining room is what you’re searching for, this is truly it. Home design services have created what would be a small space into a larger than life, inviting area for a dinner for four. Some dining areas need to be warm and comfortable for a weekday family dinner. This room, surrounded by cabinetry with personal items, creates the inviting atmosphere for families and guests alike. A dining room overlooking an in-house pool? Yes please! Home design services have created this unique room (the pool!) with the dining room adjacent. Watch your children have a dip while you enjoy dinner. 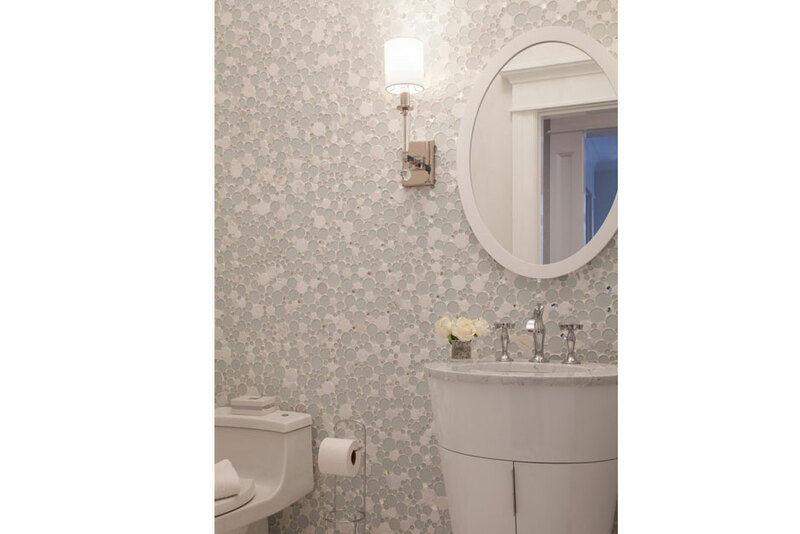 Don’t hesitate to add a little or a lot of bling in a powder room. 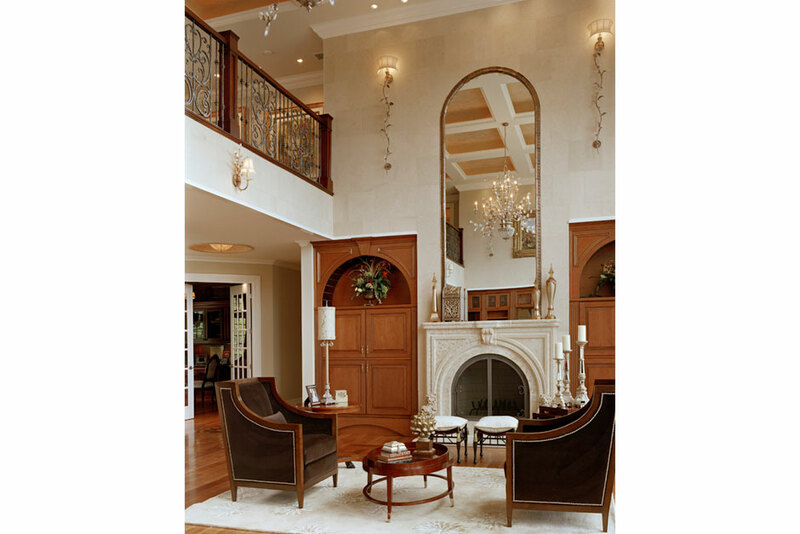 The mirrored glass and marble tile, along with the light fixture add sparkle and class. Ask about bathroom design services with or without bling! Just off of the mudroom comes this bathroom. With white-linen tile and a floating sink, accompanied by walls upholstered in a grasscloth wall fabric, my Boston interior designer self is in love with this simple, practical space. An impeccable powder room awaits with neutral cremes and delicate stripes. A simple mirror compliments a bathroom design that is simply to die for in any room. Feeling like a spa, this powder room features an eclectic wall color with a lifted sink and in-wall water features. A beautiful mirror frame finishes the powder room with unique sophistication. Unique tile in this powder room truly makes the room. This bathroom design is far from simple, with plentiful tile and a unique sink feature. It is the perfect powder room for a home looking to make a splash. Make a small room feel larger than life with a wall feature and tiles that compliment one another. This powder room also compliments the home’s Greek features, with plenty of neutral tones to accompany the rest of the home’s interior. Unique tile meets a neutral wall with a creme sink in this powder room. It’s an off-hallway powder room that infuses style with practicality. Create unique rooms with interior design services that treat each room with varying personal touches. A brushed metal textured bathroom wall with staggered slate tile, a floating vanity and state-of-the-art bathroom design toilet make this an impressive guest bathroom. Infusing Greek-inspired features with this bathroom interior design is exactly what the client wanted. A unique single sink with surrounding rock makes this bathroom feel like a beautiful, inviting spa, every day of the week. An impeccably designed bathroom with a spa-like feel. The ideal combination of beautiful wood accents with chrome features make this an ideal guest bathroom for the modern, classic home. Like a beautiful, intricate design that you would see in the world’s finest hotel! 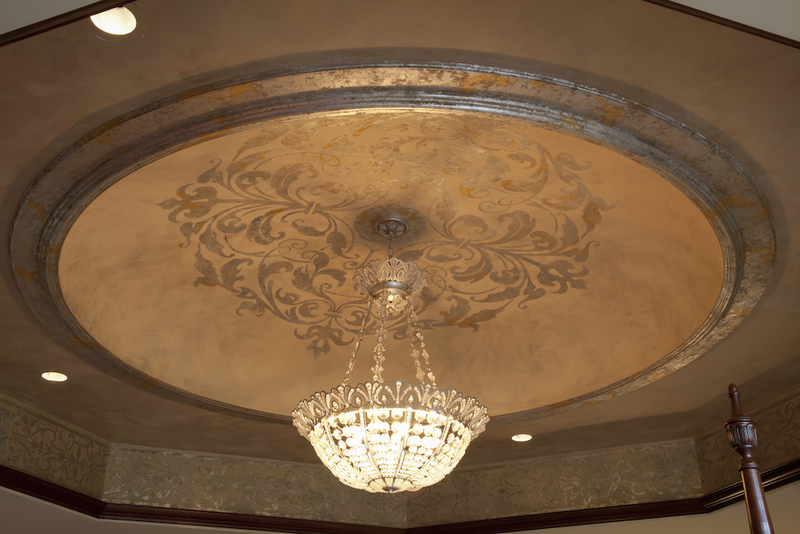 This ceiling design is simply to die for, with an incredible light fixture. An embedded ceiling truly makes this hallway leading into the great room. With plenty of furniture and remarkable artwork, the ceiling design compliments the look and feel of this home. A French-infused inspiration brings this room together, with natural light and an impressive chandelier. An embedded ceiling design is seen with the slightest of light, as it compliments the tone of the room and the lighting fixture on the ceiling. We think this chandelier is simply remarkable, and is truly an interior designer’s dream. It is built with class and sophistication alongside a ceiling design that draws attention to the best features of the room. This foyer space design is an amazing focal point as you round the staircase with specular lighting, creative artwork, patterned cushion fabric and satin pillows to compliment the wall color decor. Greeting areas say a lot about your style. You can WOW guests and make a great impression with eye-catching seating, accent tables, and discussion worthy decorative accessories. Entryway wall mirrors can make a grand yet subtle statement in a foyer design. Sometimes less is more when you use the right decor and furniture in a foyer. Consider statement pieces with luxurious design, fabrics, shapes, and metals. A laundry room needs to be practical, and this one certainly is. With a grey mosaic backsplash and bubble knobs, my home designer services came into great play with this room. I am especially thankful that I added a drying rack above the sink. Enter the home, take your shoes off and have a spot to place your jackets - simple, right? This foyer is practical, yet inviting, as if an interior designer had true efficiency in mind. It’s a foyer that looks truly like a hotel. Silvers and greys infused with marble flooring make for an impeccable home design fit for a King. A multi-level interior design home takes into account the efficiency of moving floor by floor through an entrance-way and foyer that is inviting for guests. A children’s room fit for your little Princess! We love the pinks infused in every aspect of this room, from the curtains to the rug, the crib to the mini piano. As a home designer, we really had fun with this project. Twins, perhaps? Two Princesses live here, surely. As a home designer, we incorporated the girls’ personalities into every aspect of this room. Custom bedding with matching drapes make this the most impressive of girls’ bedrooms. Complete with an elegant desk and chair, this may be an ideal space for your daughter. Impressive lighting finish the space with a young, yet sophisticated look. A pop of fuschia creates character in this girls’ bedroom. Soft pink walls with an elevated bed frame make this the bedroom design fit for a young Queen. Eclectic draping and a soft rug complete the room. Picture yourself working here! Interior design services from MDK Designs made this office an easy room to design. From sunrise to sunset, you’ll have floor to ceiling views high above Boston. Anyone working with interior design services needs a place to unleash creativity, and for me, that is my office. All of my designs take place in this office. 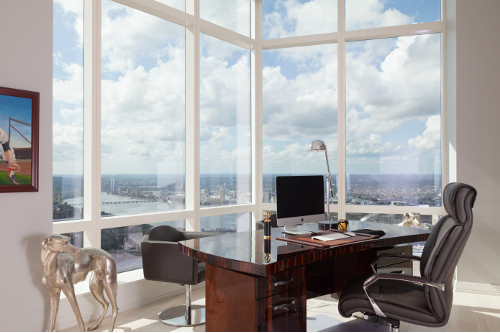 I love the custom built lucite desk and chair designed to open the space. This is my favorite distraction-free zone. This masculine office features dark wood finishes and a solid desk with straight lines. Plenty of natural light comes into this room, with a clear focus on practicality. As a Boston interior designer, I was hired to design this home office for two. I love the light fixture in my office. It adds a pop of glitz and glamour to the room, which is exactly what any interior designer loves. Custom office built-in frames and storage in dark wood compliment a light hardwood floor, finished with a home interior design touch of a solid wood desk. This home office has personality with a custom built-in wall unit displaying unique, personal momentos.